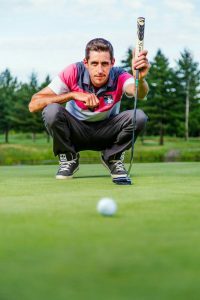 Mystic Pines is excited to announce that we are now offering golf lessons with the newest members of our team Gilles Remy, Shauheen Nakhjavani and Yves De Repentigny! Played on courses in Europe, USA, Canada, Caribbean, Middle East and Africa. Shauheen coaches players on the PGA Tour LA, Asian Tour, Web.com Tour, Mackenzie Tour, and Symetra Tour. He’s been featured on the PGA podcast “On The Mark” hosted by Mark Immelman. Shauheen has taught the game for 7 years and has given over 7,000 personalized lessons. He started showcasing his golf instruction on social media in 2015 and has developed an online following of nearly 70,000. Member of the Programme d’Enseignement Sportif du Québec. Has been a Member of the prestigious Quail Ridge Country Club in Boyton Beach for the past 8 years. Bilingual and passionate about teaching golf. Has been in charge of 20 golf camps over the years with more than 250 juniors golfers to his care. Can teach to golfers of any skill level and age . Possibility of on-course lessons with course management advice. *Range balls and clubs included in all packages. Range balls and clubs included in all packages.